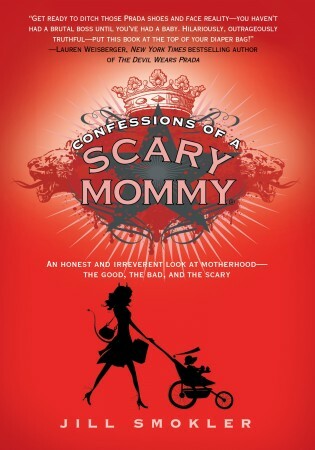 I am so beyond excited for my friend Scary Mommy! Her book is now available and is a MUST-READ for any mother! Jill and I have been blog buddies for a long time now. Back in the days when "mommy blogs" were not as prevalent, and long before Facebook and Twitter, she and I used to comment back and forth on each others' blogs. She and I had the common bonds of 3 similar-aged children, and we both started blogging as a way to remember the fog-filled days of parenting. So needless to say, when we finally got to meet in person in early 2010, it was like we had known each other all along. Jill is witty, sarcastic and most importantly, real. Confessions of a Scary Mommy is Jill's blog come to life. Real words from her, along with real confessions from real women. Nothing suger-coated. Because we all know motherhood isn't just chubby baby thighs and intoxicating new-baby scent. It's diaper blowouts. It's whining. It's boogers. It's time-outs. It's hell, at times. But it's always always always worth it. Listen, none of us are perfect. So why can't we just admit it? Jill does just that, making us all feel like we are *normal* to have feelings of frustration and inadequacy when it comes to parenting. And that, my friends? Is refreshing and validating for *this* Scary Mommy! Want your very own copy of Jill's book? Simply leave me a comment as to why *you* are a Scary Mommy too! Winner chosen Monday, April 9th. I'm a scary mom because I never have enough time to get everything done. Then I get frazzled. I'm a scary mom because I (gasp) go to work. every day. and leave my 2 kids in daycare. I was chatting with a co-worker in the elevator last week when a stranger interjected and asked me "How can you leave a 4 month old?" I told HIM I would miss work too much if I didn't come in every day. This is not 100% true :) but at that moment I felt like a really scary mom. I have four daughters under the age of 6. I work full time as a teacher and I'm taking a night class towards my second masters degree. Classic overachiever-- very scary mommy!! I knew I heard of her! I had the Today show on this AM and thought, I know that name.... Congrats to her.